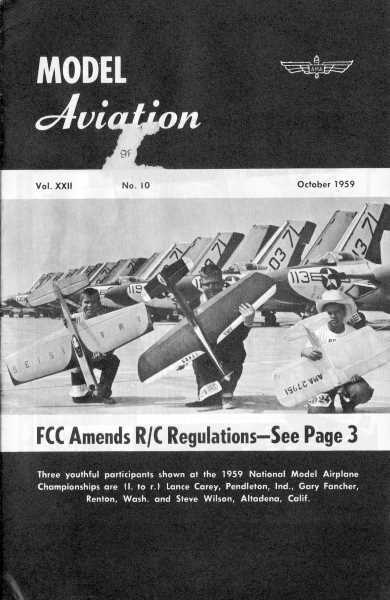 Website visitor Christopher C. wrote asking that I post the "Anti-Grav" article from the October 1958 edition of American Modeler. If you have never read about anti-gravity theory (by non-lunatics), then this would probably be a good place to start. Honestly, I was not aware of the thought experiments for anti-gravity that have been devised relating directly to the Unified Theory. Gravity has long been the sole force that has defied inclusion. The electromagnetic and weak and strong nuclear forces are fully integrated, but not so gravity. Conjecturing the existence of both gravitational creation (Hoyle) and extinction (Heim) forces provides a means of controlling the force by arbitrarily creating gravitational attractive or repulsive forces. It's an interesting read. Christopher also asked about the possibility of another locating and posting an article titled "The G-Engines Are Coming," written by Michael Gladych, an anti-gravity aficionado. If you do an Internet search on the title, you will find many references to it by seekers of the article. Author Nick Cook mentions having seen it in his book "The Hunt for Zero Point." Nobody seems to be able to locate the original source. Thanks to Bob Balsie, however, who scanned the article from his November 1956 issue of Young Men, it is now available!. 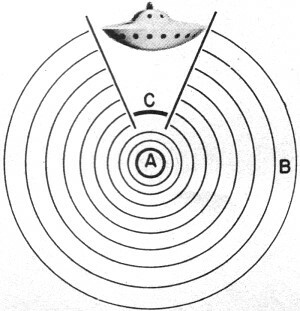 Heim's gravity drive principle is based on: A) center of earth's gravity; B) creation region (Hoyle area); C) extinction region (Kapp area); D) direction of induced gravitic acceleration. There is no record of what the professor said when he heard the news from Kitty Hawk. But he was certainly stuck with his mathematical proof that a heavier than air machine could never get off the ground. When a few years later the U.S. War Department accepted the Wright Brothers' "impossible machine" the way was opened for the present day government-sponsored gravity research contracts held by companies like Martin and Convair. A successful reactionless drive will be more fantastic than the dreams of the rocketeers. It may be even more useful for atmospheric flight than for outer space. But most unexpected-this new adventure is open to amateurs who like the Wright Brothers may be working in small shops or attics. While the experts may raise learned eyebrows, these enthusiasts will be much too busy to listen to scientific proofs that it can't be done. Michael Faraday should be honored as the pioneer who made the first serious effort to cancel gravity. The odds were all against him since his electromagnetic devices alone could not include the needed power channels. The approach has been blocked by mountains of confusion dreamed up by crackpots. One, E. W. Keely in the last century got financial backing for an "aerial-navigation" motor that blocked gravity. He gave laboratory demonstrations and had plans for an air railroad around New York City. Strangely enough, his wild writings resemble some of the latest jargon of the nuclear physicists. Gravity shield at C is projected down from ship toward center of earth at A, thereby creating neutral sink hole in spherical gravity wave B. Most proposed anti-gravity devices have been perpetual motion machines in disguise. Systems of heavy flywheels and self circulating mobile weights, have been tried as means of foiling the pull of gravity. The idea is that sufficient centrifugal force should cancel the earth's pull. If this were true, any good gyroscope would become airborne pronto. The physical fact is that any system of mass or energy moving in a self contained circuit will produce a net force of zero in any direction. 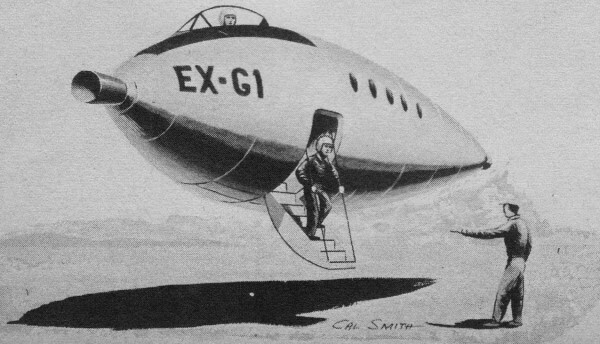 Another dream project was H. G. Wells' gravity neutralizing screen that shielded the ship from the earth's pull . A recent scientific journal carried an elaborate proof of the impossibility of gravity shields - reminiscent of the earlier proofs against heavier than air. Gravity has been studied in the stars and galaxies and in the world of the atoms. A realistic approach became possible in the same decade that saw the success of the Wright Brothers. A better understanding of the present situation can be had by running briefly through the series of revolutionary discoveries leading to Professor Heim's fantastic but entirely possible Gravity Drive. In 1900 Max Planck formulated a law stating how the amount of radiant energy given off by heated bodies varied with wave length and temperature. He used the unproven idea that radiant energy was not an unbroken flow, but was projected in individual bits which he called quanta. Five years later Einstein suggested that all forms of radiant energy travel through space in separate and discontinuous quanta. Experiments showed that a metal surface shoots out showers of electrons when hit by a beam of light. This photoelectric effect was a puzzle. Light with a higher frequency packed more punch and the velocity of the knocked off electrons was always proportional to the energy of the light hitting it. Light must consist of individual particles of energy. Einstein called these grains of energy photons. This clashed with the idea that light was made of waves. A pinhole bends light like water ripples. Two pinholes send out double concentric waves that merge in parallel strips. This double character is still unexplained, but it was an important step to present anti-gravity control theory. The large scale approach started when Galileo (although he didn't realize it then) demonstrated the equivalence of gravity and inertial mass. Newton developed the principle that a constant force produces a constant acceleration depending on the ratio of the force to the mass on which it acts. He also discovered that gravity exerts a force proportional to the mass on which it acts. Although gravity and inertia are equivalent, there is no way (with the possible exception described later), to distinguish the motion produced by inertial forces; acceleration, recoil, centrifugal force, etc., from motion produced by gravitational force. Aviators are well aware of this fact. Pulling out of a dive produces the same physical sensation as that produced in a steeply banked turn at high speed. In both cases G-loads appear. The identical nature of these effects can prove fatal in blind flying without instruments. Understanding gravitational force is the first step to its control. Einstein developed his Law of Gravitation to describe the behavior of objects in a gravitational field, not in terms of attraction, but simply in terms of the paths they follow. (The old bugaboo of "action at a distance" was finally licked). Gravity is simply part of inertia. The inertial effect caused by change of direction can be described by a fluctuating of gravitational fields. The world is a space-time continuum with metric properties that guide movements. It is the same sense of action in which a magnet doesn't really attract. Rather it creates a certain physical condition in the space around it, which is called a magnetic field. The old iron filings trick proves this. Magnetic fields are real even though they can exist in a vacuum. There are even magnetic explosions! The gravitational field is just as real. Einstein's last effort was to create a Unified Field Theory that would bind the atomic world of the Quantum Theory with the universe-sized events of his Relativity Theories. This led directly to the opening of gravity control theory. A few of the adventurous pioneers are: Dr. Hideki Yukawa who predicted the meson particle, Fred Hoyle who predicts the discovery of the continuous origin of matter, Professor R. O. Kapp who predicts the extinction of matter, Professors Yang and Lee who challenged the law of parity, Dr. Philip Morrison who described the reversal of gravity, and the incredible Burkhard Heim who is planning the actual drive for the Anti-Gravity "ship." (According to Professor Heim, the ship will be capable of speeds higher than light, achieve invisibility, be virtually crash proof, and the occupants will feel no acceleration. According to Fred Hoyle, if gravity had always been as we know it now, why is the universe expanding instead of rushing together? He believes that gravity did not always require that two particles rush together. Attraction only occurs if the distance between the particles is not too great, otherwise attraction is replaced by repulsion. The densities at which repulsive gravitation become operative are so low that there is no question of the ordinary attractive form of gravity being modified in our solar system or in the galaxy. But this alteration of the law of gravity is needed to explain the present situation. The theory requires that atoms appear continually in the universe instead of being created in one initial explosion at some time in the past. Hoyle asks and answers a very simple question - What makes or decides the laws of physics? His answer is - The success of the predictions that are made by the equations of the theory. When they make correct predictions they are accepted. "I shouldn't have had that last piece of cheese." His theory makes possible the creation of the gravity drive. It describes in addition to the nuclear, electromagnetic, and gravitational fields, a universal creation field. Now follow the jig saw puzzle. When Yukawa predicted the meson particle in 1935 and it was discovered in 1937, its measurements did not fit any of the theoretical models of matter. In early 1957 experiments were undertaken at the University of Chicago, the National Bureau of Standards, and at Columbia University, to check on the principle of "conservation of parity." Giant accelerators fired "bullets" of tremendous energy into the atomic nucleus and produced many atomic fragments. Many of the fragments did not behave according to the principle of parity. Instead of the neat balance of left-handed and right-handed "spin" among the particles, which would prove the law of parity conservation, some showed a predominance in one direction. Professors Tsung Dao Lee of Columbia University and Chen Ning Yang of Princeton challenged the parity principle. Later in 1957 scientists at the Argonne laboratories speculated that if the parity principle did not apply to the complex nuclei and mesons, neither would it apply to the decay of neutrons (another fundamental unit of the atom). They fired a stream of neutrons off a polished mirror of coabalt. Neutrons can be conceived as tiny magnets spinning on a north and south pole axis. According to parity the electrons produced by the decay of the neutrons hitting the cobalt mirror would be shot off equally toward both poles. Instead only 62% came off in the direction of the south pole as in the direction of the north pole. Something was wrong. Theory did not agree with experimental results. The next piece in the jig saw puzzle is Professor Kapp's prediction of the random disappearance of particles. This "extinction" process is supposed to be connected with the contraction of some parts of space as opposed to the observed expansion of space. The theoretical death blow was hurled at the parity theory when it was challenged in other areas. At a historical meeting held in New York City during January of 1958, some three thousand of the country's leading scientists heard Dr. Philip Morrison of Cornell, deliver a talk in which he predicted scientific developments in the next twenty years. He extended the findings of Lee and Yang to the "very weakest of forces," the gravitational ones. He said, "Here it is already known since Einstein that even clocks and rods depend on the gravtational fields. By simple experiments in thought, one may see how it might be that the gravitational field is not conserved, but can be created or destroyed. The consistent extension of these notions can be carried on only if we deny the great symmetry - a well observed one between ordinary inertial and gravitational mass. Then it can be shown that a local measurement could distinguish an inertial from a gravitational field. If this were so, it would follow that some masses repel instead of attract gravitationally." Now comes the payoff. Dr. Heim, a German scientist who was blinded in a rocket explosion, delivered a lecture at Stuttgart a few years ago in which he gave a mathematical explanation of a gravity drive for a space ship. He refuses to publish his theory until he has proven it experimentally. His basic idea is to use a means of stimulating the "creation" process described by Hoyle and the "extinction" process of Kapp. This would enable a ship to accelerate in any chosen direction. It would have no disturbing effect on the space around it. The energy needed to move the ship would be the kinetic energy of the ship itself. The power supply would not have to be large. Very small accelerations would build up into incredible speeds, up to and past the speed of light, when the ship would become invisible and be entirely undetectable. This could be done in a circling maneuver in a small area. What the G (gravity)-Plane might look like was shown in our November 1956 Article, "The G-Engine. Are Coming!" by Michael Gladych. The ship's drive would come from the contraction of space before it through "extinction" and the expansion of space behind it through "creation." This would create a kind of wave swell of gravitational inertia that would drive the ship like a surfboard. It is not perpetual motion. Scientists have not yet definitely observed this creation and extinction process but calculations based on its reality are working out correctly. When it is observed there is no question but that the gravity drive will be built. Professor Heim's theory claims that there is a six-dimensional Meso-field that is intermediate between the electromagnetic and the gravitational fields. It can exist in two states - when "contra-baric" it transforms electromagnetic waves directly into gravitational ones. It induces the acceleration of mass from a direct conversion of electromagnetic waves. The energy is directly derived from nuclear processes. In its "dyna-baric" state it liberates electromagnetic energy directly from matter. Professor Heim has said that he knows how to immunize the occupants of a gravity drive ship against any effects from acceleration. The arrangement of his "field inducers" would permit any acceleration and sharp turns without any sense of change. The power is derived from the Mesa-field, that will be tapped through a meson converting motor. The ship is not anti-gravity in the simple sense. It creates its own gravity. Its fore and aft would drive through the Einsteinian space curvature much as a screw propeller drives through the atmosphere. Here is adventure for those seeking new frontiers. Experimental equipment is not beyond the attainment of amateur hobbyists. Even equipment for atomic experiments is well within the cost range of much model building equipment. There is also the opportunity to perform navigational experiments with equivalents of grav-field drives. Model builders who use radio control and servo devices will find this especially exciting. There are no guides. Every try will have to be original. A good simulated space field can be made by covering a table with a series of electromagnets. The similarity of magnetic and gravitational fields makes possible a study of techniques of maneuver. Metal objects placed above an electromagnetic field experience an upward thrust that is well known in the old Mohammed's Coffin trick. If the object is held in the hand the sensation is that of movement through thick molasses. A small metallic ship model could be navigated over such a field, if suitable controls are designed. (The exact technique is contained in most physics texts under Lenz's law). While this is only a simulated gravity drive. it can give some real experience into the navigational problems to be encountered when a real ship is built. Some ingenious experimenter will figure out how to reverse the process by placing his electromagnets in the grav-ship model and covering the flight area with a sheet of metal to simulate the earth's surface. Sound far-fetched? Well, who in the early 1900's would have thought that a couple of bicycle mechanics could have pioneered the opening of the skies?